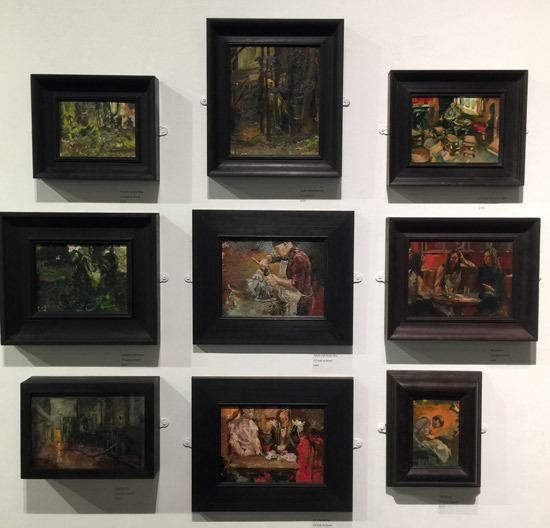 Yesterday I was really impressed when I walked into the Threadneedle Space at the Mall galleries and saw Lewis Hazelwood-Horner's solo exhibition which is part of the The Columbia Threadneedle Prize 2016 which he won earlier this year(see Lewis Hazelwood-Horner wins £20,000 Threadneedle Prize 2016). 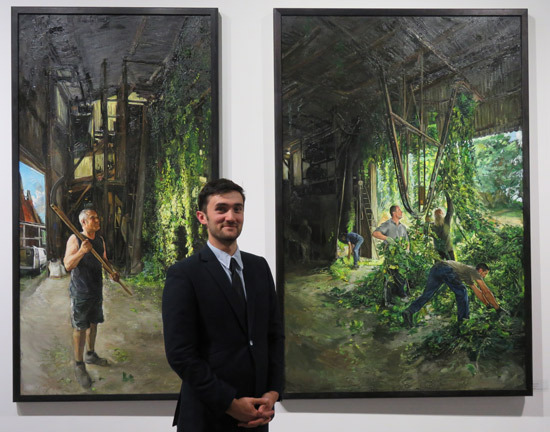 Lewis Hazelwood-Horner and two of his large paintings about processing hops for beer. 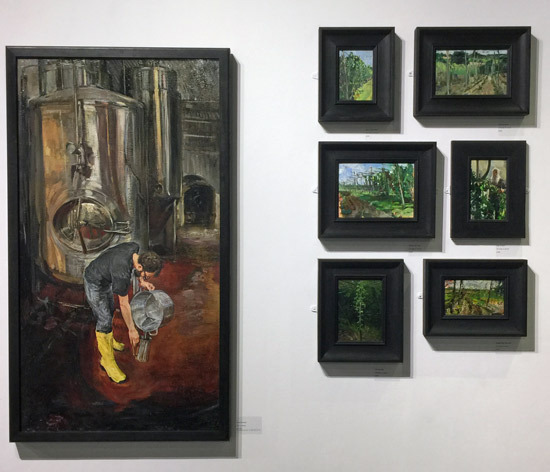 The idea behind the prize is that the winner gets a hefty cheque - which then gives him or her the time and space to paint - and then a one week solo exhibition later in the Threadneedle Space. This serves as a 'shop window' for the potential of the artist to impress art galleries, art collectors and those who might need want to commission a work. Well the exhibition by Lewis Hazelwood-Horner impressed me - and then some! It's one of the very best exhibitions I've ever seen in that gallery. It's well hung and 'hangs together' but it's the content which is amazing. I've been bemoaning for some time that we no longer see narrative paintings which tell a story or document the present day - where we see ordinary people in their natural context. Instead we see landscapes without people, townscapes with anonymous people and portraits of individuals which rarely tell a story. It can get boring. What we get with these paintings is engagement with both the process, the people and the place. It's real life and it's a really valuable exercise to be documenting these processes in 21st century Britain. They're also very striking paintings - Lewis has a keen eye for a good composition and clearly demonstrates a real love of his media and painting. What the artist does with this exhibition is tell complete stories about the trades and crafts. His story of brewing from hop field to brewery vat is extremely impressive. The works reveal how old practices have evolved over time, showing the importance of the lightness of touch of a skilled and experienced craftsman (or woman), that cannot be replicated by machine. In my opinion, any business activity which involves a craft or artisan process should seriously consider commissioning Lewis to undertake a residency. He is very clearly an artist who can bring their activity to life on the wall of their offices. "Beer and Guns" is at Mall Galleries in central London, between 19 and 24 September 2016. Admission is free and the gallery is open from 10am to 5pm (closes 4pm on final day). If you're interested in figurative painting I very much recommend you see it. An exhibition with a big impact! Lewis's painting Salt in Tea won the Columbia Threadneedle Prize 2016 in February. His painting was selected for the top prize of £20,000 and a solo exhibition from 3,828 entries. It also won the Visitor's Choice Award - and won Lewis a further £10,000. The painting portrayed the work of the bespoke umbrella shop, James Smith & Sons, in London’s West End and followed a two year residency. The Columbia Threadneedle Prize - Call for Entries - The Columbia Threadneedle Prize 2016: Overview of the Call For Entries and the changes since the last time this competition was run in 2014. Selected Artists - The Columbia Threadneedle Prize 2016 - Overview of the artists selected for The ColumbiaThreadneedle Prize 2016 - including images and links to artists' websites. The Columbia Threadneedle Prize 2016: Shortlisted Artists - Images of the shortlisted paintings for the ThreadneedlePrize 2016 and profiles of their artists. Threadneedle Prize 2014 - The Shortlist - A review of the artwork and artists shortlisted for the Threadneedle Prize 2014. The Threadneedle Prize 2014 - what's changed and how to enter - Review of the changes in the 2014 Threadneedle Prize and the Call for Entries. One month left to enter £30000 Threadneedle Prize - Overview of the Call for Entries for the £30000 Threadneedle Prize (2013) for Figurative and Representational Art - deadline 4 July 2013. Threadneedle Prize 2013 - Selected Artists - List of the artists (+ websites) selected to show their paintings and sculpture in the Threadneedle Prize 2013 Exhibition at the Mall Galleries. Call for Entries for £30000 Threadneedle Prize 2012 - Making a Mark - Overview of the Call for Entries for the £30000 Threadneedle Prize for Figurative and Representational Art - deadline 23 May 2012. Threadneedle Prize 2012: Analysis of entries - Threadneedle Prize 2012: An analysis of the art competition entries and artwork and artists selected and comparison to 2011. Threadneedle Prize 2012: names of selected artists - List of selected artists for the Threaneedle Prize Exhibition 2012 - plus links to their websites. Threadneedle Prize 2012 - Exhibition now Online - how to access the Online Exhibition of the Threadneedle Prize 2012. Threadneedle Prize 2012 - Shortlisted Artists - The winners of both The Threadneedle Prize (£30,000) and Visitors' Choice Prize (£10,000) will be announced at a special Awards Dinner on Wednesday 10 October 2012 - to which I'm invited. Review: Threadneedle Prize Exhibition 2012 - Review of the Threadneedle Prize for Painting and Sculpture 2012 Exhibition at the Mall Galleries. prizewinning events select the, " flavor of the month". Not so with this choice. Thank you for sharing the exhibition with us .